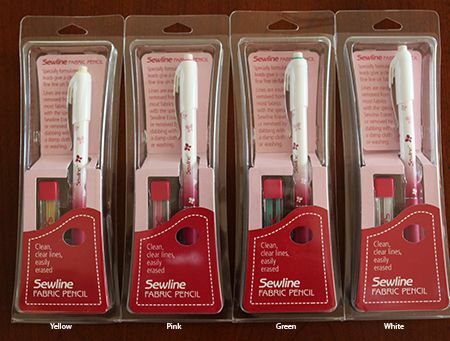 I love these Sewline markers. The line is easy to see on my fabric. It comes off by either erasing, brushing or washing. What's better than one fabric marker? A set of four.....one of each color...pink, green, white and yellow. The recommended retail price is $55.80. Your price at a 20% discount is $44.50. White Sewline Marker. I really like these Sewline fabric markers. They have a specially formulated lead which produces an easy to see fine line on your fabric. The lines can be removed by using the eraser on top of the marking pen, brushing off or washing. They come with replacement leads and it is easy to refill the marking pen. And I love the cushioned handles. It is very comfortable in your hand. The retail price is $13.95. White refill lead for the Sewline marking pen. The retail price is $6.50. Pink Sewline Marker. I really like these Sewline fabric markers. They have a specially formulated lead which produces an easy to see fine line on your fabric. The lines can be removed by using the eraser on top of the marking pen, brushing off or washing. They come with replacement leads and it is easy to refill the marking pen. And I love the cushioned handles. It is very comfortable in your hand. The retail prics is $13.95. Pink refill lead for the Sewline marking pencil. Green Sewline Marker. I really like these Sewline fabric markers. They have a specially formulated lead which produces an easy to see fine line on your fabric. The lines can be removed by using the eraser on top of the marking pen, brushing off or washing. They come with replacement leads and it is easy to refill the marking pen. And I love the cushioned handles. It is very comfortable in your hand. Green refill lead for the Sewline Fabric Pencil. Yellow Sewline Marker. I really like these Sewline fabric markers. They have a specially formulated lead which produces an easy to see fine line on your fabric. The lines can be removed by using the eraser on top of the marking pen, brushing off or washing. They come with replacement leads and it is easy to refill the marking pen. And I love the cushioned handles. It is very comfortable in your hand. Yellow refill lead for the Sewline Fabric Pencil. This disposable, mechanical fabric pencil with ceramic lead gives you clear, clean 1.3mm lines. This is twice the thickness of standard fine leads. The lines remove easily. I have successfully removed my marked lines using a Bohin Fabric Eraser, or a micro fiber dust cloth. They have also washed off of my fabric. I really like the thickness of these lines. If there is a downside it is that they are disposable and do not have replacement lead. The retail price is $2.95. This disposable, mechanical fabric pencil with ceramic lead gives you clear, clean 1.3mm lines. This is twice the thickness of standard fine leads. The lines remove easily. 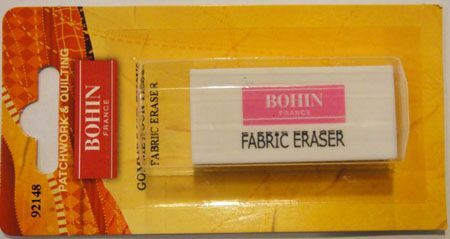 I have successfully removed my marked lines using a Bohin Fabric Eraser or a micro-fiber dust cloth. They have also washed off of my fabric. I really like the thickness of these lines. If there is a downside, it is that they are disposable and do not have replacement lead. Water soluble markers can be quickly removed with water. Works well even on coarse fabrics. The retail price is $5.00. Water soluble markers can be quickly removed with water. Easily remove pencil marks from your fabrics and/or quilts. This is an excellent marker to use on dark fabrics. The first time I used this marker I thought it was not working. But, within a couple of seconds the line I drew, which was invisible, dried to a wonderfully fine, easy to see white line. To remove the mark simply iron it away or wash it from the fabric. The retail price is $6.75. For the past ten years I have been using this transfer paper. This package contains 2 (9" x 13") sheets of grey and 2 sheets of white so you will always have the right color no matter the color of your background fabric. These sheets are reusable many, many times over. The process works like this. Tape your background fabric, right side up, to a hard, flat surface. Either tape or pin your pattern, right side up, on top of the fabric. Now, slide a piece of the transfer paper between the pattern and fabric. It’s like the meat in the sandwich. 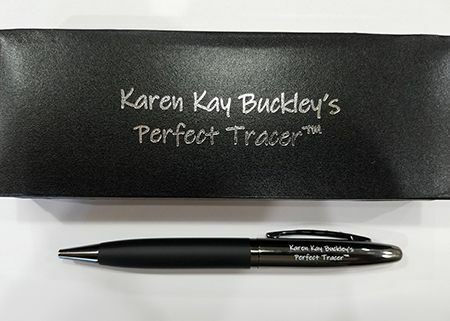 Using Karen Kay Buckley's Perfect Tracer, trace over the lines of your pattern. When you remove the pattern and transfer paper you will have nice thin lines to follow on your background fabric. CAUTION: Always test before use to ensure the lines can be removed. I have used a fabric eraser or a micro-fiber dust cloth to brush the lines off. Or they have washed away with plain water. If for any reason you find the lines are not easy to remove trace inside the lines of your appliqué shapes to ensure the lines will be covered when you are finished. The retail price is $3.95. Karen Kay Buckley's Perfect Tracer is the perfect compliment to the transfer paper. The tracer has a soft grip making it more comfortable during the tracing process. It comes in a nice box which provides a great place to store your tracer for easy access when needed. The retail price is $3.99.